KIEV, Ukraine -- The burly man with the close-cropped silver hair and his two companions ask not to be identified too closely when they talk to me in some dowdy offices near an ancient monastery overlooking the Dnieper River. 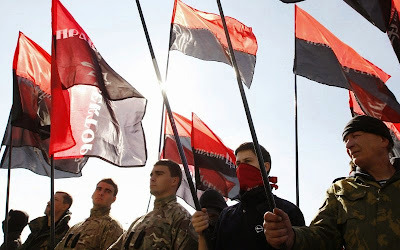 The men behind Ukraine’s nationalist militias are looking to replace the fumbling government in Kiev one way or another. They want to be described as “patriotic businessmen,” they say, and one of them, whom we’ll call Alexander, is a very, very rich patriotic businessman. They have been funding Ukrainian self-defense militias formed in response to what they see as the ineffectiveness of the Ukraine Armed Forces in the face of pro-Moscow separatists and Russian troops in the country’s southeast. And they suggest something worse than incompetence is at work there. The word “betrayal” often plays on their lips. They predict the government of President Petro Poroshenko may not last another three months. Alexander and his friends point to continued military hardware exports—sometimes transferred via Moscow-ally Belarus—sent from some of Ukraine’s 134 state-owned defense enterprises to Russia, which has long been the Ukraine arms industry’s biggest customer. The trade flouts a March 2014 prohibition on all exports of weaponry and military equipment to Moscow. Poroshenko reinforced that ban in June with a presidential decree, but Alexander and other businessmen contacted by The Daily Beast say enterprises are still disobeying the order. Some are doing so because there’s money to be made and recession is hitting this key sector; others because executives and workers in the defense plants, mostly located in the east and the south of Ukraine, are sympathetic to Russia. Earlier this month, nationalist businessmen alerted Ukraine’s Prime Minister Arseniy Yatsenyuk to the imminent shipment of key components for military radar systems mounted on Russian Shilka self-propelled anti-aircraft guns. Yatsenyuk blocked the shipment from Kiev’s Arsenal arms factory. The state-owned Motor Sich engine factory in Zaporizhia, a southeastern city on the Dnieper River 140 miles from the separatist stronghold of Donetsk, has been the most flagrant exporter. Company executives make no bones about Sich’s exports to Russia of military helicopter engines. Last week, Sich executives signed a preliminary agreement that would see the company manufacturing in Belarus gas turbine engines for Russia’s Cruise missiles. “The economic interests of some are at odds with the country’s interest,” says Alexander, smiling cynically. The “patriotic businessmen” ascribe the failures in the war effort to a mixture of lack of political will, sabotage, and inept Soviet-style bureaucracy. “Bill Gates could give Ukraine a billion dollars and the results would not be seen on the front lines and the volunteer militiamen would get nothing,” says Alexander in a booming voice, spreading his arms wide. His two colleagues nod assent. “You have to understand the bureaucracy still has the mentality of the Soviet past,” says another we’ll call Yuri. Winter clothing for the 15,000 or so volunteers in 37 pro-unity militias is uppermost on the minds of their patrons—the temperatures here are turning sub-zero now and the first snow of winter flecked Ukraine’s capital this week. Down in the southeast, militiamen and many Ukrainian regulars are still in lightweight camouflage—the best off are the separatists and the Russian “volunteers” backing them up who sport new insulated winter outfits. On the militiamen, he says there are no plans to help them with equipment. Gratitude isn’t what volunteers in the so-called territorial defense battalions want from Kiev. They want more determination from authorities, a greater sense of direction, and they need more equipment. And their suspicions make them see betrayal at every turn, even when incompetence may be the cause of a particular problem. They are suspicious, for instance, that American non-lethal aid is being sold to the separatists, after spotting separatist fighters with U.S.-supplied Meal Ready-to-Eat rations, although these could easily have been looted. Alexander and his colleagues are looking to battalion commanders who have been elected to the new parliament to start forming a voting bloc to force through change. They are talking about setting up a parallel defense ministry in the form of an NGO to provide greater command-and-control structure to the militias. But in the end there is no substitute for government when it comes to war fighting. “Poroshenko said in the summer that he needed a new parliament and government to get things moving,” says Alexander.